Sanchita Tiwari, student of Amity International School, Sector -1 Vasundhara made the Nation proud by winning Bronze Medal in Cadet Compound Girls’ team event at Youth Archery World Championship held at Rosario, Argentina in October 2017. To promote Archery sport amongst students, Amity International School, Sector -1, Vasundhara organized maiden Inter Amity Archery Competition 2017 where in Amity School students were provided with an opportunity to exhibit their skill and finesse in this ancient heritage sport at Amity International School, Sector 1, Vasundhara. The aim of the competition is to encourage maximum student participation and promote healthy competition. 12 participants (class 6th to 12th) from 8 branches of Amity Schools including Noida, Mayur Vihar, Sector 6 Vasundhara, Sector 1 Vasundhara, Gurgaon Sector 46, Gurgaon Sector 43, Saket and Pushp Vihar participated in the competition. Addressing the gathering, Dr. (Mrs.) Amita Chauhan, Chairperson, Amity International Schools said that this initiative of the Archery competition has been organized to identify and empower the talent of children who will be the pride of nation in future and bring medals. Congratulating Sanchita Tiwari for her momentous achievement, Dr. Chauhan mentioned that she is an inspiration for others and now aims to win Gold and Silver for the country in International Competitions. Speaking on the occasion, Sanchita Tiwari thanked Chairperson Dr. (Mrs.) Amita Chauhan madam, Mr.Lokesh (coach), school teachers and her parents for their constant support and encouragement that has led her to win the Bronze Medal. She added that her coach and parents have always motivated her and helped in balancing between studies and archery practice. 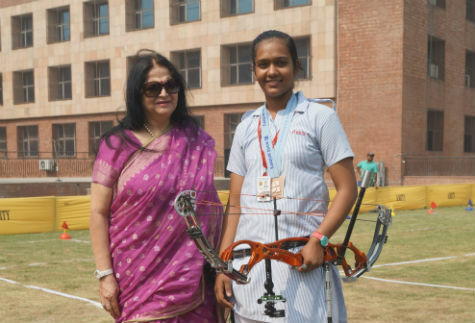 Calling Dr. (Mrs.) Amita Chauhan as “Superwoman”, she remarked that the Chairperson madam has provided the platform of archery and always guided her in every possible way. Sanchita mentioned that she drew her inspiration from ‘Rani Lakshmi Bai’ for her inclination towards the game. She expressed her hope to win Gold medal for the Nation soon in upcoming International competitions.